Dermaclinix is high quality clinic providing hair and skin treatments to people in different age groups. We have well trained team of doctors who are professionally trained from one of the most popular medical institutes of India named- All India Institute of Medical Sciences (AIIMS), Delhi. We are devoted to provide high quality services to our customers by the use of most sophisticated machines and instruments made with latest technology. Dermaclinix is a popular clinic of Hair Transplant in India treating the people all over the globe. Dr.Kavish Chouhan is the Director of DERMACLINIX Dr. Kavish Chouhan and is considered amongst the best dermatologist and hair transplantsurgeon in INDIA. He has done his MD in Dermatology from the prestigious All India Institute of Medical Sciences(AIIMS), DELHI. He has experience of successfully performing >1000 hair transplant procedures by FUE. 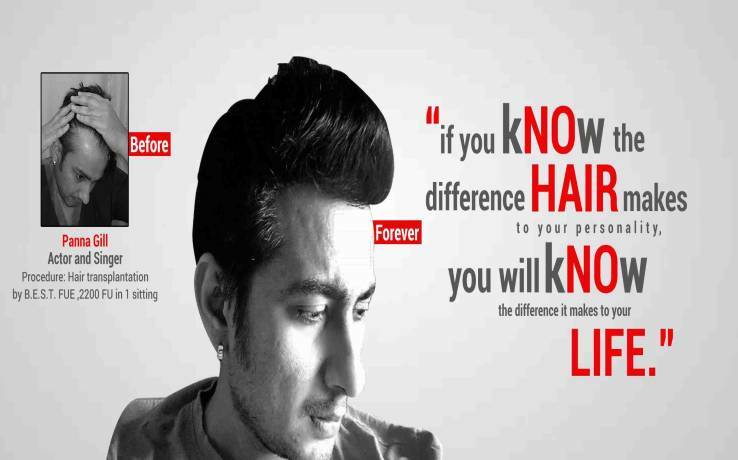 He specializes in doing mega & giga sessions of hair transplantation by FUE. He has experience of successfully performing many hair transplant procedures in AIIMS, PGI and in his own practice. He has upgraded his skills by tips from world leaders in hair transplantation including Dr. Alex Ginzberg (Israel), Dr. Shapiro (USA) etc. He also had been involved in teaching many post graduate students the art of hair transplantation. He was amongst very few Indian Faculties who were invited to take lecture in the prestigious ISHRS (international society of hair restoration surgery) 2013 Meet in San Francisco, USA on “HAIR TRANSPLANTATION BY GIGA SESSION (>3500 FU) FUE”. He also has take guest lectures in various national & international confernces like AAHRS/HAIRCON 2013 in banglore, Pigmentricon 2013 in Goa, World congress of dermatology 2010 in South Korea, DERMACON 2012 in guraon etc. He is amongst the pioneers of PRP (Platelet rich Plasma) treatment & PRP-ACell for hair fall in INDIA with >500 PRP done over last 3 years. He has several publication in indexed journals like Lancet, British Journal of Dermatology (BJD), Clinical & experimental dermatology(CED), JCAS etc. He has published the world’s first case of “Body Hair Transplantation in Vitiligo” in JCAS 2013. He has been awarded “Best young dermatologist” in CUTICON 2010, DELHI & Best poster award in DERMACON, 2011. Dr. Kavish chouhan is a qualified physician member of ISHRS (International Society of Hair Restoration Surgery) since 2010. Dr. Amrendra Kumar, another director of DERMACLINIX completed his MBBS from PMCH Patna followed by MD (2008 - 2011) in Dermatology, Venereology and Leprology from one of the finest and tertiary care hospital of country, at All India Institute of Medical Sciences (AIIMS) New Delhi. He worked as a Senior resident at Post graduate institute of medical education and research (PGIMER), Chandigarh in Department of Dermatology and Venereology (2011). He is an expert of Hair transplantation specially with FUE method. He has a rare distinction of doing megasessions and gigasessions with FUE method and specialized in body hair transplantation. Dr.Amrendra Kumar has a vast experience of four and half years’ in Clinical Dermatology, Venereology, Dermatosurgery, Lasers and cosmetology from both the premier institutes of the country (AIIMS, New Delhi and PGI Chandigarh). His research topic was on acne vulgaris and Vitiligo (leucoderma). In clinical dermatology his interest areas are pediatricdermatoses, management of resistant acne, vitiligo and melasma. During his stint at AIIMS, New Delhi as junior resident and at PGI, Chandigarh as senior resident he not only gained vast experience in managing difficult dermatology problems but also did a lot of work in dermatosurgery (Hair transplantation, Acne scar surgery, Vitiligo Surgery, mole/nevus excision, Scar revision, and Ear lobe repair, nail surgery), Lasers (Hair removal, Pigmentation, Birth mark, Tattoo, Vascular lesions, and Skin resurfacing) and Cosmetology (Microdermabrasion, Chemical peeling, Microneedling and Fillers). She has represented her alma mater in various national and international conferences for various quizzes, posters and oral presentations. She was the coordinator and facilitator in various national and international conferences (Aesthetics, ISDS- Acsicon) for dermal fillers, PRP therapy, and chemical peels etc. We use the thinnest possible needle (32 G) for administering local anaesthesia with advanced cooling and vibration which makes the whole process almost painless. He has experience of successfully performing >3000 hair transplant procedures by FUE. He specializes in doing mega & giga sessions of hair transplantation by FUE. He has experience of successfully performing many hair transplant procedures in AIIMS, PGI and in his own practice. He has upgraded his skills by tips from world leaders in hair transplantation including Dr. Alex Ginzberg (Israel), Dr. Shapiro (USA) etc. He also had been involved in teaching many post graduate students the art of hair transplantation. Our Doctors is a qualified physician member of ISHRS (International Society of Hair Restoration Surgery) since 2010. He also is a member of ISDS, ISD, MMDS, IADVL, PDS etc. FUE or follicular unit extraction is a magical technique that will help you get relieved of baldness. Hairs are thought to define an identity of a person. They act as an element of beauty to you. As people use artificial make up and accessories, hairs are the natural make up god has gifted to all. At old age it’s natural to lose hair cover but at young age it can be due to a serious medical problem. In late 90’s a technique was developed to re-grow the lost hair count using the patient’s own follicular unit. This technique was known as follicular unit extraction (FUE) or follicular transfer (FT). It comprises of hair transplantation by FUE along with 3 sessions of Platelet rich plasma therapy which simultaneously enhance residual hairs as well as transplanted hairs by presence of high concentration of growth factors directly near the hair roots and stimulation of STEM CELLS. In this hair follicles to be transplanted are preserved in a special solution enriched with patient's own growth factors and at the end of surgery this concentrated solution of growth factors is injected into the whole affected area. We are seeing that because of biostimulation a good proportion of transplanted hairs remain in growth phase (ANAGEN) and directly start growing after transplantation. We prepare PRP with a specialized technique ensuring very high concentration of growth factors which is confirmed by advanced lab tests. DermaCliniX specializes in providing hair transplantation treatment, laser hair removal, anti-aging, and skin care treatment. These treatments are carried out at our Clinic by highly qualified doctors or Under their able guidance by Professionally qualified technicians. Our team of members comprises highly qualified laser operators, OT technician, Senior dermatologists, and best cosmetic surgeons for both men and women. This team gives their best efforts to meet the requirements of customers and provide best in class treatment to our esteemed clients. We do not compromise with our quality and health care procedure and maintain higher standard of patient well being. Our facilities are well equipped with most advanced machines in the field of medical science wich are well maintained for the purpose of disinfection and hygiene. We endour to in part best of our services with utmost care and customer centric approach. We are dedicated whole heartedly in setting higher standards in providing proper treatments to patients. We choose our doctor carefully because they are responsible to bring reputation to our clinic by providing best treatment solutions to patients. The staff members are trained to provide safety to patients, and help the doctors during treatment. Out main motto is to serve people with full dedication. So, if you are searching for any anti aging, hair transplantation and reduction, skin care treatments then you can visit our clinic and find the best solutions for yourself. We will help you out getting right assistance and provide the best treatment for your skin and hairs. These treatments will be fully tested under the adverse conditions and will benefit you in all aspects. We will try our best to help you out fighting with the side effects, if any occur during or after the treatments. We are fully dedicated and supportive to our client. So get your treatment planned today. "It was an amazing experience to come to INDIA for getting my Hair transplant done by Dr. Amrendra. I am thrilled to see my new hairs growing. My whole stay here including airport transfers, hotel stay and the procedure was made quite comfortable by staff so much so that I felt like a VIP. The pricing was at least 5 times cheaper in comparison to Australia. Doing FUE hair transplant in advanced baldness is a very tough task but to my surprise the doctor made it so comfortable and virtually painless. I would strongly recommend for FUE Hair transplants by Dr. Kavish Chouhan and Dr. Amrendra Kumar." "I am thankful to Dr. Kavish Chouhan and Dr. Amrendra Kumar for changing my life. Now I look 20 years younger. My friends and relatives were unable to recognize me after the transplant they all feel now I look young and smart. I didn’t expected results to be as good just at 6 months thanks to advanced biostimulated FUE. I feel very confident now with this new look." DERMACLINIX is one of the best hair transplantation centre in ASIA run by renowned Dr. Kavish Chauhan (MD-AIIMS, MISHRS-USA) & Dr. Amrendra Kumar (MD-AIIMS, MISHRS-USA). They have taken faculty lectures and workshop in all major international conferences including International society of Hair Restoration surgery (ISHRS). They are the pioneers of Biostimulated FUE and PRP-A Cell therapy which are considered the most advance hair transplantation procedures with almost 100% graft survival and early results. The clinic is equipped with state of art machines to ensure highest standards of care.